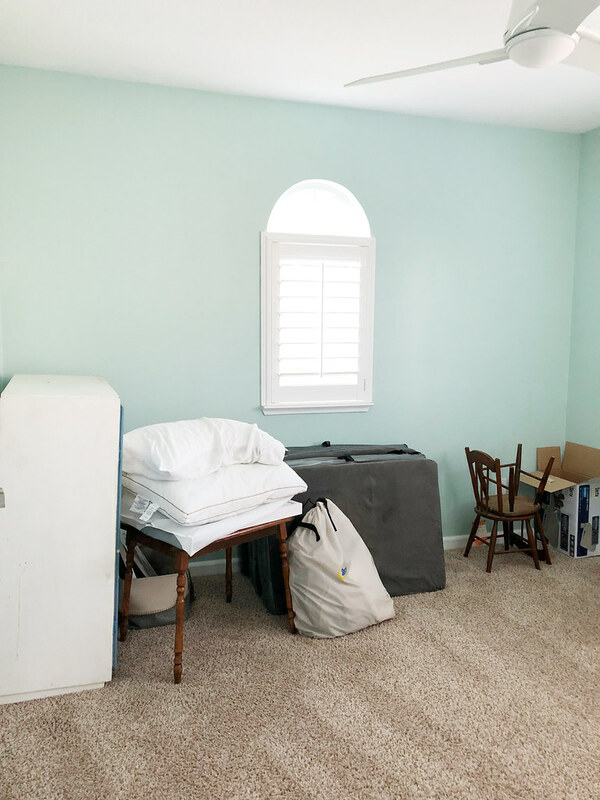 This week the One Room Challenge kicks off, and my room of choice is the spare bedroom. Hopefully one day this will be a nursery but for now will be turned into a guest bedroom. I want to preface this by saying no, we are not pregnant. I honestly don’t know when we’ll be trying for a baby again. I have some “stuff” I’m working through, and there are a handful of projects we want to tackle before we’re ready to go down that road again. One of those projects IS this room. Originally I wanted to do the laundry room as our ORC, but with the amount of work that needs to be done, it won’t be done in time. Since we’ve had family coming into town quite frequently to stay with us I figured we’d turn the spare bedroom into a guest room. Right now this room is acting as a dumping ground for random stuff as well as a second guest bedroom when we have more than one family member stay with us. Several months ago my sister lived in this room when she was transitioning from her apartment to San Diego. Since then it hasn’t gotten any love. That’s about to change! 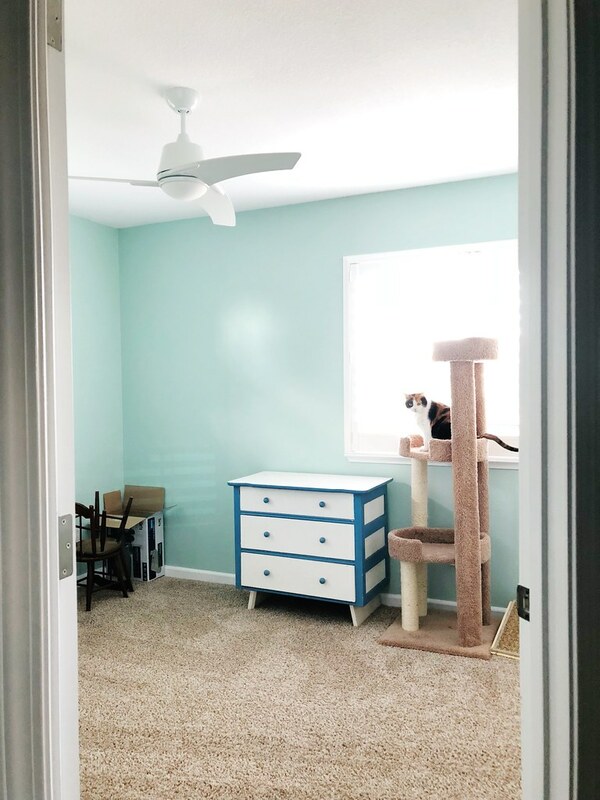 My thought process behind this room is getting it to be as close to a nursery as possible without feeling like a nursery. The idea is that when the time comes to change it to a nursery, all I’d have to do is replace the bed with a crib and add more baby-type stuff to the room. 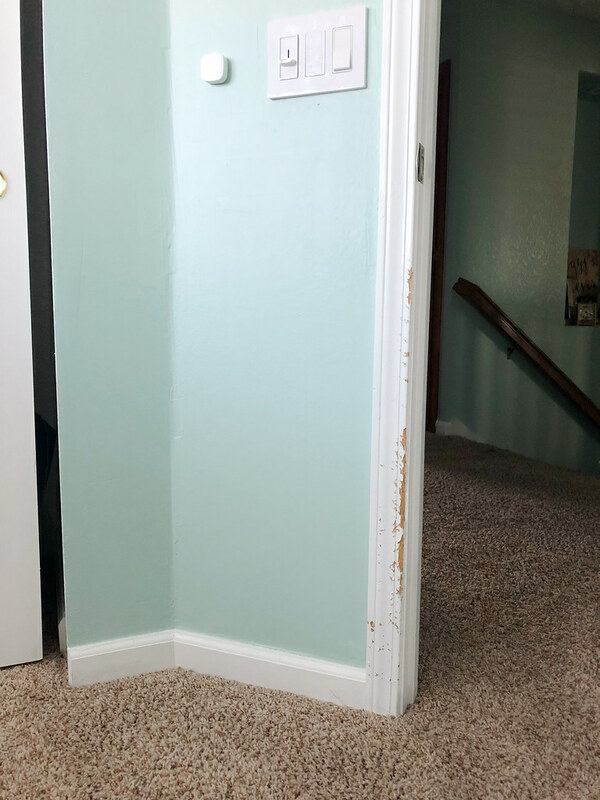 My sister’s cat Louie unfortunately scratched up a good chunk of the trim when staying with us, so that’s something we’ll be fixing. This furniture was in my nursery as well as my mom’s, so they are very special heirloom pieces that I want for my future child. Painting them is something I want to do myself; I don’t want to get pregnant and then not be able to paint them. This will probably be the most time consuming part of this whole project. I want to give one of those mattresses-in-a-box (like Casper, Leesa, etc.) a try, and I think getting a twin one for the guest room would be perfect. I had a convo about them with my coworker whose planning on getting one, and I was telling him how I was hesitant because it comes in a box so how do you know if it’s going to hold up over time. He told me that’s why they are going with a brand called Tuft & Needle (which I’ve heard Dave Ramsey talk about) which is American-made, has a 10 year warranty, and you can pick it up at Lowe’s. Other furniture pieces I might get would include a lamp, a chair, a small nightstand, and some kind of bookshelf. It’s a small room, so I’d want to get the bed in there first before adding anything more. I’m considering putting in blackout curtains, but I’m not sure because of how the windows are in that room. And of course, I also want to add some other guest amenities to make it feel as homey as possible.